The story of the creation of Usonia, in Peasantville, New York, has been ably told in Roland Reisley’s book Usonia, New York: Building a Community with Frank Lloyd Wright (Princeton Architectural Press, 2001). Usonia the community was the brainchild of David Henken, an architect who served an apprenticeship with Wright in the early 1940s and approached Wright about designing the Westchester County community for 47 families in 1946. 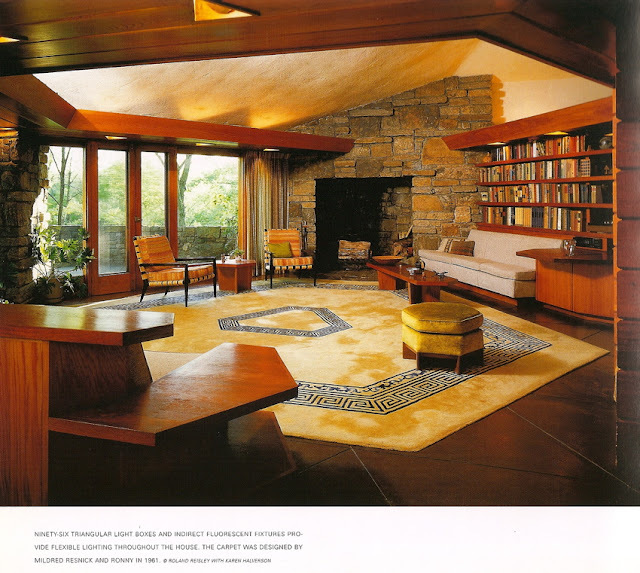 Wright designed three of the houses, the rest were designed by Henken and numerous other progressive architects. 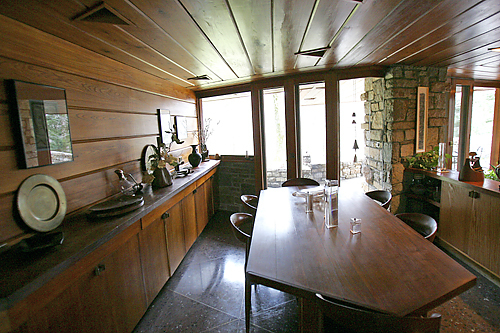 The Reisley House (1951) was the last of the three by Wright. I had visited and toured the house briefly on two occasions in the past but this time my mission was to ask Roland questions of a phenomenological nature, that is, I was seeking insights of a direct experiential nature, insights that are not only about the visual but those that involve the tactile, the sonic, and the kinesthetic. My project turned out to be quite challenging. Coming from Buffalo where I have had a long exposure to Wright’s local Prairie houses I found the geometries of the Reisley House distracting as we talked but wonderful to experience. The planning grid consists of equilateral triangles 40 inches on each side (as opposed to the square grid of the Martin House). Such a grid offers a 120 degree angle for wide vistas but also narrow 60 degree angles that can be difficult to use. Roland commented that Wright was ingenious at finding locations and uses for such angles. 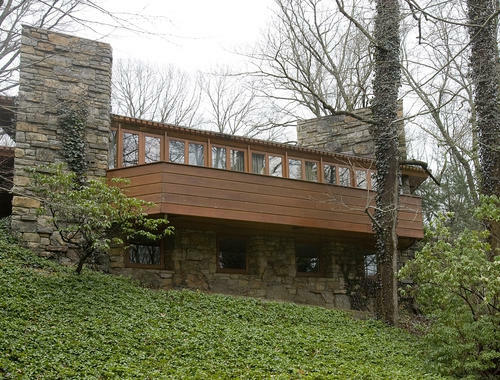 Wright made the triangle the theme of the entire house with roofs, prows, balconies, and a 1955 addition (for the children) all darting off in different directions from its lofty wooded hillside site. As a result everything about the house is experienced on the bias as opposed to the conventional rectangularity that most of us live with. Moving through the house is akin to experiencing a jazz-like rhythm. While negotiating this unconventional geometry everything – fine, horizontal cypress walls and ceilings, panoramic windows, stone masses that glide effortlessly past sheets of glass, cantilevered prow-shaped roofs – conspires to draw one's attention out into the surrounding landscape. Although this is not unusual in Wright's houses the sixty and one hundred and twenty degree angles feel more natural and engaging. The living room, seen below in one of Roland's photographs -- a serious photographer, he had Wright include a darkroom in the basement of the house -- warrants close study. The bookshelf at the right has no back and functions as a semi-transparent screen particularly when approached from the master bedroom. A greater transparency occurs as floor-to-ceiling windows and inset doors cross the south end of the living room, pivot 120 degrees at a triangular granite pillar and continue as the door and window wall of the dining room. Nature wraps itself around the house. It is no wonder that Roland Reisley has lived in his home for sixty two years and continues to find beauty in it every day. Thank you so much for sharing such insightful information! I am a student at Parsons The New School for Design in Manhattan and Frank Lloyd Wright is my greatest inspiration. I am originally from Wisconsin where, as you could imagine, I was always surrounded by his work. In the City, however, it's difficult to have such experiences. I am researching Usonia in Pleasantville and I would absolutely love to visit the area. My only concern is that I might arrive there and not be able to see much of the private, tucked away residences. Anyway, (I apologize for the length of my comment) would you possibly have the contact of someone that I may be able to speak with in regards to a visit to Usonia? I would truly appreciate any help in making this trip. Feel free to e-mail me at b.baerwolf@gmail.com. Thank you so much, I hope to hear from you soon! 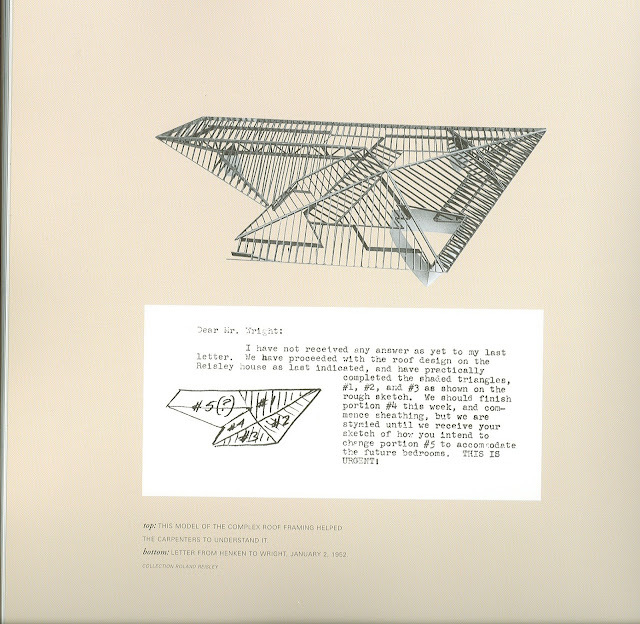 “Architectural preservation of Frank Lloyd Wright’s buildings”. Your article will be very useful to me, because the main theme of my research is the Usonia II in Pleasantville. -Can you suggest to me some texts about the restorative measures that took place on Sol Friedman House, Reisley House and Serlin House? Are the houses in excellent conditions or suitable for some restorative measures? - Do you know if I can visit the site freely, and develop a land survey and an analysis of the facades? I thank you in advance for your attention and your kindness. I look forward to receiving your response soon.